This website is by no means intended to freak the total crap out of couples with plans to have a baby, or travel in space. Quite the opposite! Babies and interstellar travel are super rad. However, when you look at it (or any 3D ultrasound), the whole process of gestating a new human being starts to seem just a bit science-fictiony. Follow us on Facebook. It’s the best way to get terrible advice about parenting. Want to know what other outrageous things and people a baby is like? You’ve come to the right place. None of these have acid for blood. So there’s that. Takes on the morphology of its host. Our youngest used to — literally — give me the facehugger when he was hungry and I wasn’t giving him his bottle quickly enough. Love the last 2 items under general attributes. Pure GENIUS as always. “Was put in this belly by a grabby, overeager creature.” Sounds like this was written by my wife. yip, babies enter our home just as THE ALIEN did . unexpectedly. 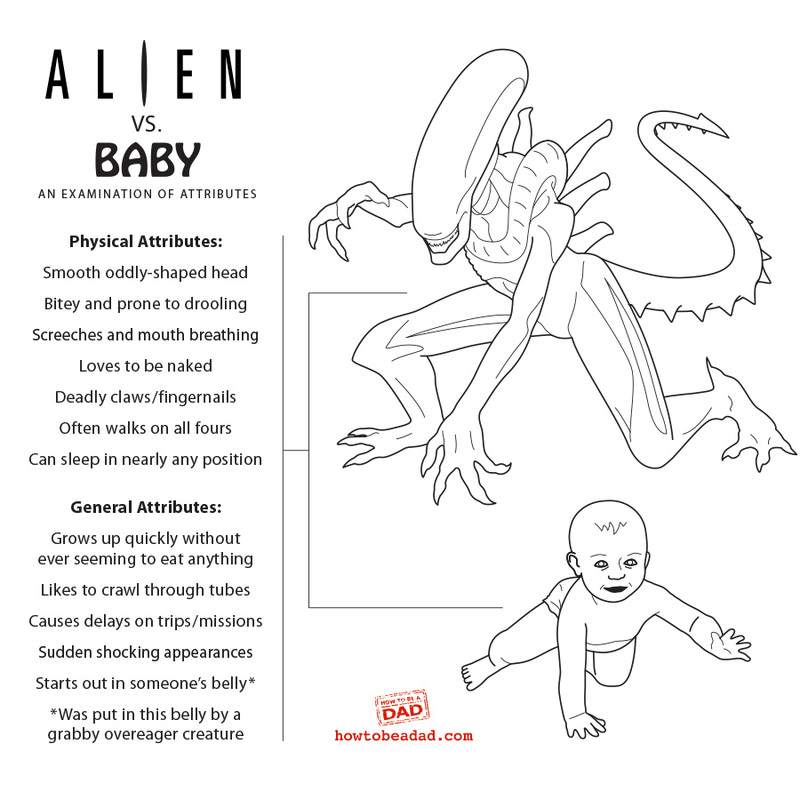 http://pappiebear.blogspot.ch/2014/07/alien-vs-baby.html check this article for another perspective. Love these – use the zombie vs baby as right brain icebreaker before teaching classes – students love!!! as far as Alien vs Baby – How about they both sometimes make a mess on your chest? too vague? Anyway – I do not accept any new ones that are not up to par from my students, so I need to make sure my reasoning on this one is not flawed ……………..
Glad you like them! That’s amazing you share it with your students. 🙂 I guess that works for Alien vs Baby, but I’m not sure what you mean; why you want to add other comparisons.